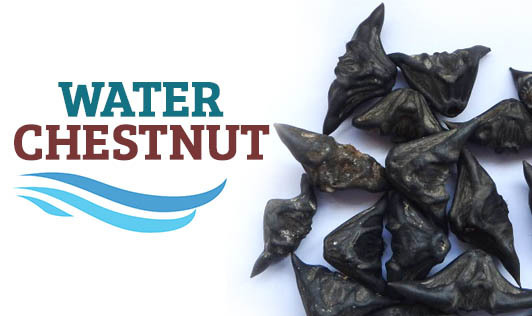 Water chestnut as opposed to the name is a vegetable grown in aquatic areas like ponds and marshes and unlike its name has got nothing to do with nuts. Commonly known as paniphal or singhara in India, water chestnut finds frequent culinary uses in Chinese cuisine. The plant is immersed in water for a little less than half its length and the chestnuts can be found growing hidden under the leaves. Though seasonal, chestnuts are sold as canned and processed foods throughout the year. Water chestnut can be consumed raw, boiled, or as part of filling in various preparations. It has a characteristic mild flavor, bitter-sweet taste, and a crunchy and juicy texture. Water chestnut has various health benefits too. It is very low in starch and fat and is a great source of fiber (aids in improving digestion and reducing cardiovascular risks), vitamins and minerals, especially potassium (maintains normal blood pressure, water, and electrolyte balance), and vitamin B6 (activates enzymes in various biochemical pathways and aids in metabolizing proteins). Since it has a high moisture composition, the vegetable helps quench thirst, reduce hunger, and promote cooling. In the raw form, water chestnut is recommended to treat diarrhea and jaundice. It also plays a crucial role in ensuring healthy functioning of the thyroid gland.